The first major effort to compile comparable nationwide data on health services wait times suggests that skyrocketing demand in the so-called priority areas of cancer, heart, diagnostic imaging, joint replacements and sight restoration hasn't appreciably lengthened the time it takes to get treatment. But Canadian Institute for Health Information (CIHI) officials are quick to caution that conclusions drawn from its recent report, Waiting for Health Care in Canada: What We Know and What We Don't Know are suspect because of data collection and methodological issues. “There is no average person or average wait,” Yeates says. 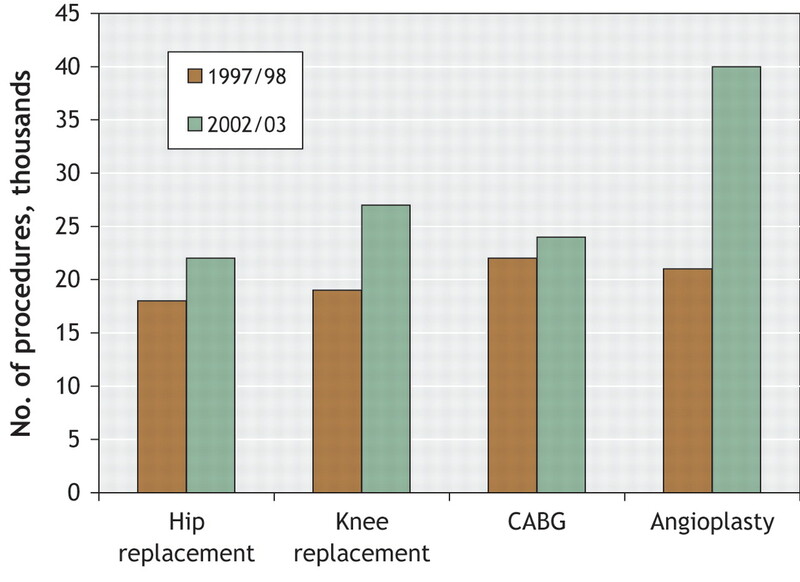 The report indicates explosive demand for services, including a 51% increase (by 22 000 cases) between 1998–2003 in the number of cardiac bypass surgeries and angioplasties; a 30% hike (up 11 340) in knee and hip replacements; and a 32% increase (62 000 cases) in cataract surgeries (Fig. 1). Fig. 1: Five-year increase in numbers for 4 procedures. Note: CABG = Coronary artery bypass graft. Overall, the report projects roughly half of all patients wait less than 30 days for non-emergency surgery, with hip and knee replacements taking much longer, typically 3 months. Roughly 10% of all patients wait at least 6 months for treatment. The report also indicates that queues to see a specialist are typically long. In the case of hip and knee replacement patients, often 30% of the overall wait time is spent waiting for the initial visit with an orthopedic surgeon. Mike McBane, executive director of the Canadian Health Coalition, a pro-medicare lobby, expressed concern that the focus on wait times is deflecting attention from needed systemic changes.